I get asked quite often what I think will be the next popular style or trend in the beer scene. I have zero idea as beer snobs are preferring all things dank, while breweries are constantly coming up with experimental batches of beer as well as trying to replicate recipes from several decades or centuries ago. I think old beer recipes and styles will be one of the popular trends in the near future. 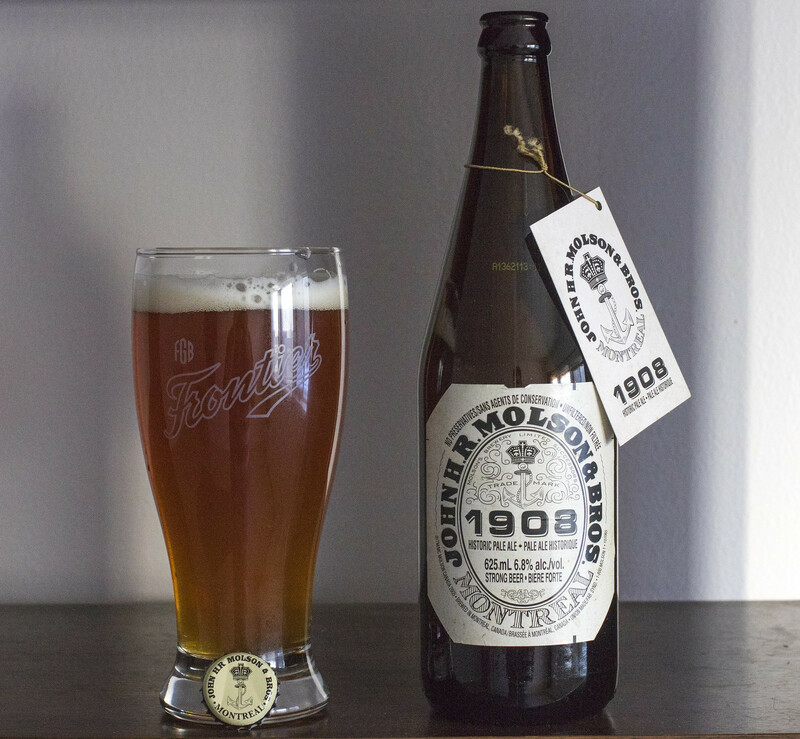 The folks over at Molson came out with the John H. R. Molson & Bros 1908 Historic Pale Ale which is described as being a strong and unfiltered historic pale ale from a recipe found deep in the Molson archives. Seeing that breweries like Sleeman have been open to using old centuries old recipes for quite some time now, it looks like Molson is doing the same. I think this will possibly turn into a new series for Molson where they bring recipes that our ancestors were drinking over a century ago. As it is, Molson's sales are slipping compared to buyout hungry Labatt and beer geeks my age aren't going out of their way to drink Molson Canadian or Coors Light - or any beer that our parents drank when they were our age, so of course it makes sense that they would bring back recipes that would cater to this generation's beer geeks? Most beer geeks won't be drinking this beer anyways but for me.. I have to check it out because.. well.. people want to know! Appearance: The 1908 Historic Pale Ale pours a bit of a somewhat cloudy amber ale, bit of an orange hue. Good amount of whiteish-beige head. Aroma: A very grainy pale ale. There's some notes of a barley grainery, a hint of caramel malt sweetness, as well as a bit of a angel food cake bready sweetness, grassy hops, hint of lemon and a bit of a musky yeast. Taste: This is a bit reminiscent to the Fort Garry 1930s Frontier Pilsner that was available in Manitoba a few years back - very grain forward. As this is an unfiltered pale ale.. of course the grains would stand out more than in a "typical macro" take on the beer. Notes of saltine crackers, a mild grassy hop bitterness, lemon, hint of pepper and French baguette. Surprisingly bitter for aftertaste as it was much more neutral and grassy in the aroma. Overall Thoughts: Not your father's beer, for sure. While I'd love to bash this beer and make this a "Skunksworth's Barleyslime" post.. but this is a solid pale ale with a good amount of noticeable grassy hop bitterness and a medley of different flavours that make it very enjoyable to drink. I appreciate that Molson has been making some effort to open up and brew styles of beers that today's beer geek wants to try. Your average beer geek will walk past this beer and never try it.. but at under $3.41 for a 625mL bottle, it's really affordable. It tops out at 6.8% ABV, stronger than the typical Molson non-malt product. 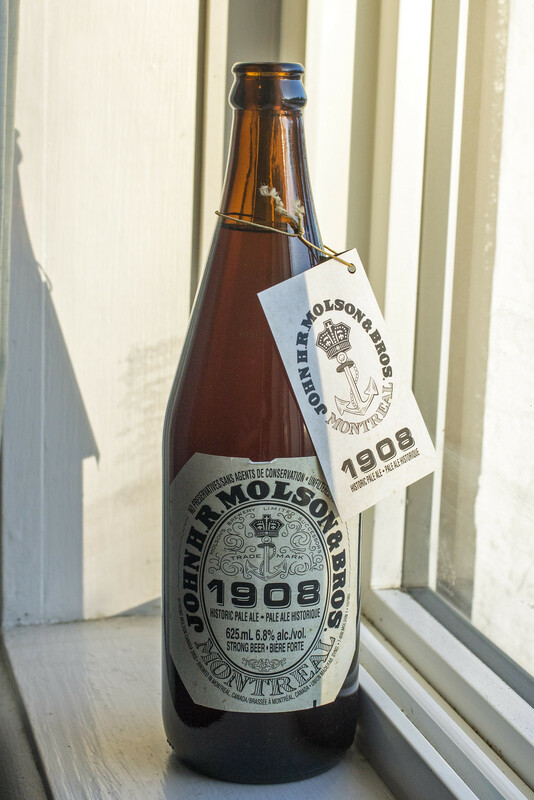 Will we see more offerings from the John H. R. Molson & Bros line? Probably. I'd like to see a porter. Please people. Embrace this as a step forward in the beer revolution. I've tasted some true micros lately that can't come close to this attempt. Congrats Molson. Keep it coming. Not bad. I can see this beer as an interesting alternative to Unibrou's luneup of strong beers. It also doesn't have the typical aftertaste of regret that follows the consumption of piss from a can/bottle, so that's a plus. Pleasantly surprised by this one. Craft brew taste from a corporate brewery!